After uploading her original song to the competition Sarah May is up for a $30000 prize pack to kickstart her musical career! Sarah May is now in the TOP 12 in the Bank of Melbourne Music Competition, selected down from 500 applicants! Sarah May came has been to Mittagundi 4 times and her song "Trapped" emerged after growing and developing here at Mittagundi. Voting has begun for the top 4 finalists! You can show Sarah your support by registering your vote below . . . Check out the Winter Newsletter! See the snow dumps, the smiling faces and hear all about what Phil, Sampson, the rooster and the crew have been up to this busy Winter!! This edition also includes wrap ups of the City Hop, NE Hop and Alpine Walk! So what are you waiting for?? Get reading! Read the Autumn Newsletter and you'll discover who the 2015 staff are, what's been happening on the farm and news from events such as fruit bottling, the Walk In, Sweet Valley Sounds, Mittagundi Festival and Folk Rhythm Life Festival. Wow a lot's been happening! Friday Jan 9th kickstarts the events with a Bush Dance followed by our Open Day with demonstrators showcasing pioneering skills. Come play traditional games with us and buy something from our auction. Spring is done and summer is here! – as the saying goes “another one bites the dust”. Can ya sing it? Louder! But we “can’t stop the music” and Mittagundi has a lot of it as the Noisy Camp attracts young people to the banks of the mighty Mitta Mitta! So we keep rolling out our sleeping bags and socialising with a great bunch of kids. I just love watching the staff work with these young people – growing confidence, skills and patience. So in my sadness to let the staff team of 2014 go, I would like to say “Thank you Sandon, Aly, Jesse, Claire, Toby and Michael,” your contribution to Mittagundi has been extraordinary. Not only has the team devoured the year with learning and fun, they have also followed my visions and values all the way through. They have continued to clean up the property from winter storms, look after the animals, build toilets and fences, revamp the garden, make stuff, while providing quality programs. I wish the team the best of happiness and recommend a holiday before working or studying hard. (The staff’s reflections have been added to this newsletter). I do get to keep two other staff we employed during Spring - Claire Peck (Business Manager ) and Sal Kimber (Communications Officer). Together we have been Spring cleaning our marketing materials and developing action plans. SO! Watch out 2015 here we come with renewed energy and purpose. Our vision is to accelerate our bookings and get out there talking about Mittagundi. If you are involved with groups, education institutions, service clubs, schools and youth groups, we would love to talk to your group about what we do. Another interesting opportunity for all you lot out there wanting to help fundraise or support Mittagundi . . . we are creating Mates of Mittagundi. Yep MOM! Because Mom’s support what we do right? You will need to register with Sal Kimber when we have our systems ready to run. Mittagundi featured in Weekly Times! THERE’S no power, no technology, no mirrors and no watches allowed, yet teenagers willingly apply to stay. Welcome to Mittagundi, a 160ha not-for-profit farm and outdoor education centre at Glen Valley, in Victoria’s remote High Country. And according to director Liz Leyshan, the centre is all about changing young people’s lives. “There are plenty of kids who don’t want to come here when they find out there’s no electricity,” Liz says. “But those who do come do so because they want to challenge themselves. Mittagundi was established in 1978 by Ian Stapleton, who is now retired in Harrietville, but at the time worked for adventure organisation Outward Bound and later Geelong Grammar’s Timbertop. He later added another property in 1989, Wollangarra, at Glenfalloch near Licola, which is today run along similar lines to its sister centre, Mittagundi. “Ian realised a lot of rich kids had experiences of being in the outdoors and he wanted to create a place for those who came from a low socio-economic status,” Liz says. So today Mittagundi — like Wollangarra — is run for kids aged 14 to 17, some of whom pay the $425 fee to stay in the rustic quarters, manage the farm animals and take part in outdoor activities. Throughout the year the centre runs ten 10-day programs, starting out with a two-day hike from Falls Creek to the 160ha property. 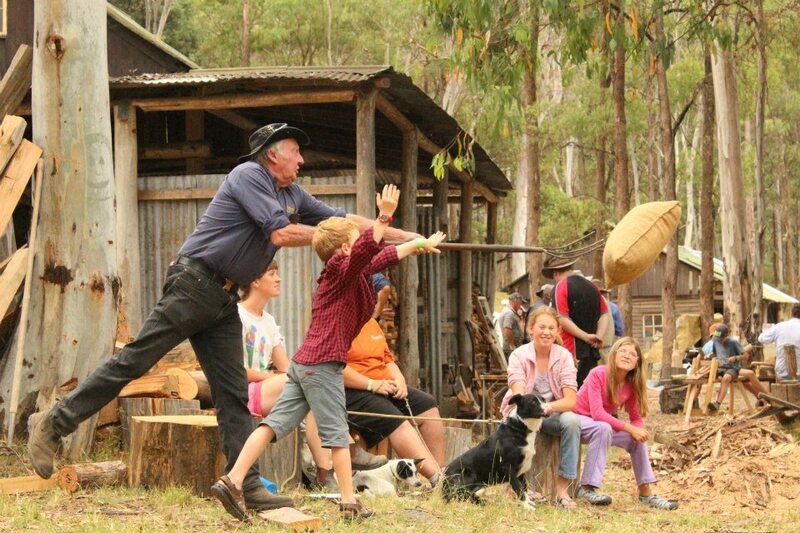 What follows is a combination of activities, including milking the cows, feeding the pigs, chooks and horses, working in the blacksmith forge and in the woodworking joinery, as well as abseiling, rafting on the Mitta Mitta River and hiking around the foothills of the Bogong high plains. “Because we don’t have watches, we use the sun for our activities, getting up at dawn, eating at dusk,” the 40-year-old says. Mittagundi runs largely on donations and sponsorship and is managed by a staff of seven, who are paid an honoraria of $6000 a year. Wow what a Winter! Snow down to 500m’s at times, multiple severe frosts, cold days, some warm days, clear days and windy days. Yep! Its Winter in the Valley and the wood is burning fast. Since our last newsletter in April we have had an Alpine Walk lead by Foss and Casey with 10 students from Wollangarra and Mittagundi. We would like to thank them for completing this epic walk and the fundraising is much appreciated. After finishing a couple of programs over the Easter holidays we helped Tess and Graeme Payne host the first ever ‘DO Lectures’ in Australia. Much is to be said about this event. It was an inspiring event and we made some new friends and opportunities for Mittagundi. In May we had a mix of programs, planning for winter jobs and cleaning up around the property. When Jo Stewart from Green Lifestyle Magazine came to visit Mittagundi she pretty quickly knew there was a story in it. Hence our leap into the limelight in this beautfully written piece. With fresh, energy and enthusiasm they are whipping the place into a land of Fun and Adventures, ready to welcome the talented teens Nationwide. Come up and meet them and enjoy a 'tea with a view'. Have you been to Mittagundi? If you have, then you know what it is all about. Mittagundi was "built by young people for young people," that means to keep it going it takes those willing young people who feel like they have gained something from their time there to spread the love and get others involved. We're not a big organisation in size, but we are big in the experiences we want to share and we need you to help us do just that. Haven't finished reading yet and want to know all the news Download the full pdf version of the newsletter here. We've just recently launched a new website. We're steadily making improvements so if you spot anything that's not quite right contact tom@cloudninja.com.au.